The following are some of my free downloads, plus a few handouts from past events. I’ll continue adding more, regularly. Evaluating Famous Haunts – How to decide whether a famous location is worth investigating. 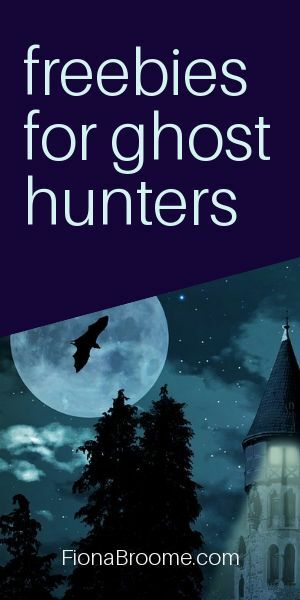 Everyday Ghost Hunting Tips – A printable PDF with ideas for finding local haunts. (Related article: Everyday Ghost Hunting) Plus, Everyday Ghost Hunting MindMap – This PDF is designed to print on an 8.5″ x 14″ (legal size) sheet of paper. Getting the Most from Ghost Hunting Events – Preparing for the best investigations and fun. Halloween Checklist – Get the most from your Halloween investigations. Presentations – How to Organize Your Ghost Hunting Talks – If you’re speaking at an event, to a club, or to a library audience, use this checklist to look and sound professional. When to Go Ghost Hunting (Using Folklore) – General advice, and an old-school method involving “planetary hours.” Does it really work? I haven’t a clue, but some readers reported good results. You’ll find more how-to handouts, worksheets, etc. in my free Hallowfields Ghost Hunting Academy courses. They’re at Hallowfields.com. Pendulum Chart – Numbers – If you’re using a pendulum and want a numeric answer (like “how old are you?” or “when were you born?”), this chart can help. Pendulum Chart – Yes/No – If you’re using a pendulum and looking for a yes, no, or maybe answer, use this chart. These are updated handouts from my Dragon Con presentations around 2008 – 2010. Each was in the context of a sci-fi or fantasy TV series. Of course, those shows were fictional, but some of the elements could be used for real research. Torchwood Notes (Dragon Con presentation) – I’m still a big fan of Torchwood, though I’ll admit some of the tropes were overused. This handout was a crash course in identifying patterns related to UFOs and aliens. Warehouse 13 Notes (Dragon Con presentation) – This handout talks about finding powerful and haunted objects, and related artifacts. Yes, it’s somewhat tongue-in-cheek – please keep that in mind! – but the basic concepts are a core part of my paranormal research. Cemetery Pre-Research – What to do before the main investigation at any cemetery. Haunted Cemeteries Mindmap – What to think about, choosing and investigating haunted cemeteries. Ley Lines of Atlanta (and other ley line maps) – Too old to leave online. It’ll be updated it soon, and add it to my revised ley lines book.